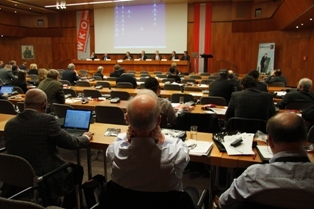 The Second European Real Estate Convention, focused on Education for Professionals in Europe, took place on Friday 19 November 2010 in Vienna. The aim of this working session was to discuss and check options and working priorities for CEPI in the area of education for real estate professionals. Chaired by Mr Yves Boussard, from FNAIM (France), and organised in collaboration with FIV (Austria) and CEI, with the kind support of Eurokaution, the Convention focused on the three pillars which form the education program for future agents and property managers in Europe basic education (the main means through which future real estate professionals can gain access to the profession), continuing education (key in particular for Central Europe countries, as well as real estate agents who work or wish to work beyond borders and require networking or European references) and membership criteria for all CEPI member associations (a difficult and complex issue, which may constitute a decisive breakthrough in the discussion concerning the recognition of professionals and their legitimacy). After a brief introductory speech by Mr Hans Joerg Schelling, Vice President of The Austrian Chamber of Commerce, Mr Thomas Wiedmann, from DG Internal Market, made a presentation on the European regulator’s support of the recognition of qualification efforts of the real estate professionals. Georg Flodl, from Austria, presented, together with Xavier Ortegat CEPI’s initiatives to follow up on the revision of the Directive on the Recognition of Professional Qualifications. Mark Van de Woestijne, Chairman of the CEPI Education Permanent Committee, briefly introduced the revision of the education requirements for the property agents, while Sylvain Grataloup, from , IDIAB, Lyon III (France), shared his reflections on the reviusion of the requirements for property managers. The afternoon session focused on the link between the CEPI qualification requirements and the CEN qualification standards, with Prof. Dr. Margret Funk ( OVI and University of Applied Science Wiener Neustadt (Austria)), and on a new training module for property managers in Central Europe, introduced by Prof. Dr. Schulte from IREBS (Germany). The last guest speaker, Dr Paul Kelly, from IAVI (Ireland) finally presented a concept paper on a CEPI lifelong learning programme for property agents. All documents are available in the CEPI European Conventions section.